Wish I could put up the photos I took of the relatives, but I do not have their permission, so I’m sticking to scenes of great natural or urban beauty/interest and strangers, who are in my picture by virtue of being in the right place at the right time. 🙂 For now, I’m just putting in a few pictures from the Norway part of the trip. I’ll upload more later, but these were handy! 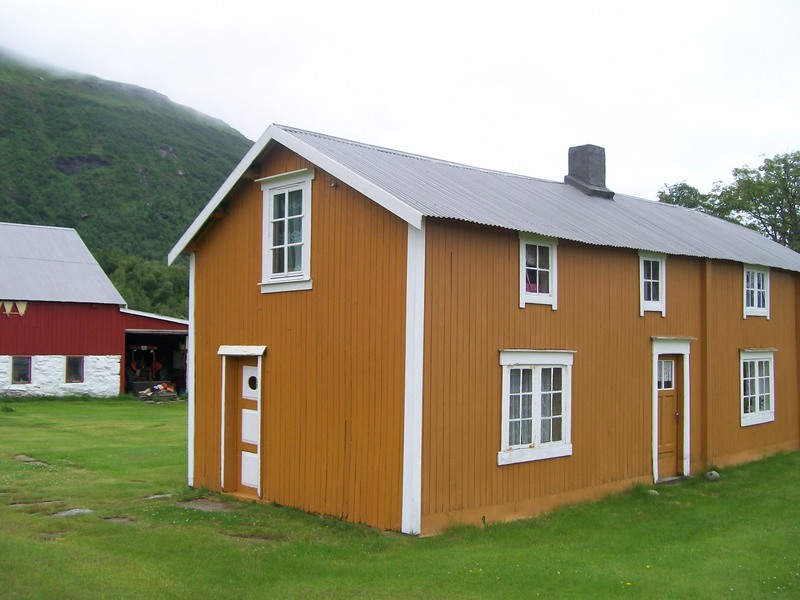 We visited an old home near where my family used to live in the villages of Kløkstad and Skau. The traditional colors for houses were this ocre, a brick red, or white (if you had money). We were lucky enough to get to visit this house and see the inside as well as the outside. Charming and cosy! The Adelphi? No, that old rundown hotel was blaring Barry Manilow as we walked into the ballroom to enjoy a lovely afternoon tea. The desk clerk had confirmed that they served until four o’clock, so we had hustled up from our Mersey Ferry ride to the Adelphi and arrived at 3:30 expecting a nice treat for our last day in Europe. AARGGH! Our final day of the trip and stymied at last. We would have no tea, it seemed, for everyone we asked for the next five minutes (and we tried all sorts, believe me) stared at us as if we were asking for a salad bar in Antarctica. So we gave up and decided to eat lunch at the Philharmonic Dining Rooms restaurant near our hostel again. We knew at least they’d be willing to feed us something, and they’d be open. Along the way, a sign caught the corner of my eye: Afternoon Tea. Ah ha! Turns out we found the best, no, the only, place in Liverpool to have a delicious afternoon tea in a modern and stylish environment. The Rivva Room, at # 1-11 Hardman Street, Liverpool, L19AS, boasts a fine menu of sandwiches and cakes, some scrumptious sounding pannini and exactly what one wants when one is a hungry and tired American who craves the afternoon tea days of her junior year abroad in London…. Fresh butter scones, Devonshire clotted cream and strawberry jam, freshly made sandwiches (one of which was chicken salad with a hint of bacon), fresh strawberries and the absolute best chocolate sauce I’ve ever tasted (we poured it on our forks when we had eaten all the berries and there was nothing left to dip). Hot tea and milk in a creamer shaped like a cow. Charming. But chic, too. Black and white interior with chrome and dark wood floors, and no Barry Manilow. Only some cool piano pieces appropriately subdued but still audible. Summertime and the livin’ is easy…. Man, ain’t that the truth. Turns out that the owner came to Liverpool only recently from London. He had gone to the Adelphi, too, for tea and found it lacking. In fact, he said, “There was no place to get a decent afternoon tea.” So he opened The Rivva Room two months ago. Already I can see he’s getting a following. As we sat there for the next hour and a half, enjoying an unhurried meal, we saw several people come and go, some clearly regulars. The table for four of dressed-up ladies who ordered American milkshakes. The elderly woman and her daughter who ordered coffee and a croissant. The salesman who was offered a glass of sherry and a friendly handshake. The Rivva Room is very close to the Philharmonic Auditorium and sees a steady stream of concert goers, too. Next time you’re in Liverpool…seven days a week, 12-6 p.m., stop by and enjoy whatever strikes your fancy. Cheers! Sorry that I’ve been off-line for a while, folks. Odd that it’s been harder to get internet in Scandinavia than in Peru…. Anyway, here’s a recap on the last part of the Scandinavian portion of my trip. Tomorrow I’ll post on the UK part. TRONDHEIM: Discovered a few key things of use there for my book. (1) Lovely woman at the folk museum called her father on her cell phone to ask him about Trondheim in 1879, the year my Norwegian relatives left. Her dad is a historian. 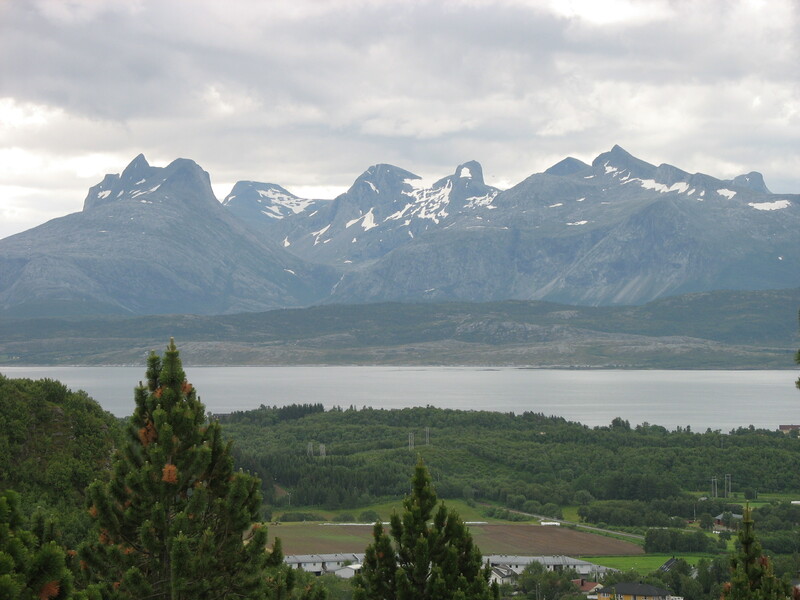 Found out the railroad had come there in the early 1870s but had not gone north to Bodø yet. So my ancestors’ week in Trondheim would probably be the first time they had seen a train. Also, the city was just starting to industrialize then, with a few machine shops popping up. They made iron stoves, among other things. (2) Lovely tour guides at the cathedral helped me put the pieces together that the ancestors would have been there during the time when they had just started restoring the ruined nave of the church. I saw drawings of what it looked like then — much diminished from the grandeur of today. That visit to the cathedral, the holiest sanctuary of Norway, made me start thinking about what my relatives would have done in Trondheim while waiting for that boat…. Ah, pray and attend church, I think. They were very religious. The tourguide ladies sent us to another old church that they thought my relatives also might have visited. Yup. Looked like their church in Bodø but only bigger and a little more ornate. (3) Also discovered that they would have stayed at a boarding house down on the canals. Interesting because there are also canals in Göteborg, where my Swedish relatives started their journey to America. Canals, I know. My own town is full of them. Anyway, got a good view of that area. Short stay in Trondheim, less than twenty-fours hours. But fruitful research. We also visited a decorative arts museum and an old fort that had been taken over when the Germans occupied the city in WWII. I’ll write more about WWII stuff in a post after I return home. It was very interesting how this kept cropping up…. BERGEN: Flew to Bergen as the train would have to go all the way to Oslo and then Bergen. A short, uneventful flight. I did not expect to discover anything of note in this city. It was merely a stopping point, or more accurately, an embarkation point for our sea journey. But, as has happened repeatedly on this trip, I gained in understanding. Perhaps the most interesting thing was just to see this part of the coast and to realize that the immigrants hugged the coastline all the way south before crossing the North Sea. Bergen was a major port at that time. While their ship did not stop there, they were traveling in waters frequented by many ships. By the way, it rained in Bergen. Anyone at all familiar with the place will not be surprised. It is like saying, “It was Bergen in Bergen.” Charming city but we mucked about with our heavy backpacks in the rain for far too long to say we enjoyed Bergen fully. Had a terrific meal at an Italian restaurant set off the tourist road one block. Not a soul in there when we first arrived, but we were starving. We sat down and had dinner while listening to loud Michael Jackson music. Waiter chose the music: “I LOVE Michael Jackson! He’s a great singer! !” Surreal. (1) There is a very dangerous and rough patch of sea between the north coast of Denmark and south coast of Norway. Our Swedes must have had a rough time traveling through there on their way to England, about a day out of the port of Göteborg. Also, they sailed at the worst time, in October, after the start of storm season. This explains why great-great grandma Lotta was so very seasick. I knew that from my grandma’s story, but I didn’t know they had very good reason to be ill.
(2) Norwegian steamers would have followed the coastline even if they did not go into port. One can totally see this after traveling by boat there. 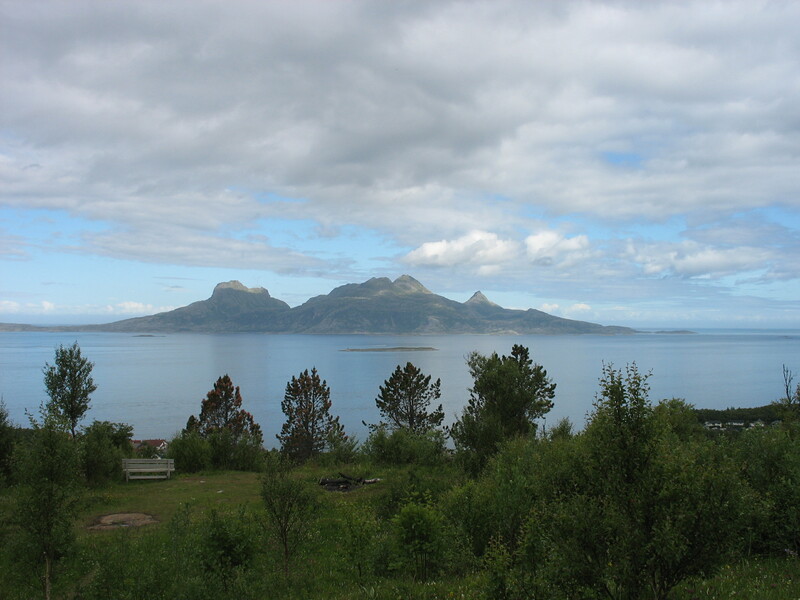 A huge difference between the sheltered coastline with its many islands and deep and easily navigated fjords and the open North Sea where the wind sweeps down from the north and huge waves can make sea travel treacherous. (3) The coast of England just appears out of nowhere, and it is relatively flat with a few hills with churches or ruined castles and a few lighthouses dotting the coast. A strange contrast to the rugged fjords of the north. When we hit the North Sea it was almost supper time. Ugh. Within an hour I decided to take the little motion sickness tablet they give out free at the information center. I went to bed and let it take effect. My friend had no problem with seasickness at all — thank goodness! When I awoke from my nap, I felt better. Decided to go to dinner as planned. Ah, but I hadn’t counted on how the sight of odd sea-related food sitting out in a buffet would make me feel, plus the difficulty of getting to the buffet and back my seat with a loaded plate. Oh, and the woman at the table right next to us who vomited on the table, poor dear. I ate a digestive bisquit and a few bites of lovely salmon, with my head turned to look out the window at the horizon. Finally started feeling clamy and made a run for our lovely cabin where I applied a skin patch for seasickness and went to bed for good. Awoke in the morning feeling much better. I kept my equanimity overall. Bed is sometimes best. Even ate breakfast that morning. But was heartily glad to get off the boat soon after that. Good thing that I took that trip, too. I discovered soon after boarding that the route is being discontinued in September. This was my only chance to trace the ancestors. Whew! What a lucky duck I am!! And now to bed. I shall write about the UK tomorrow (more interesting stuff)…unless I can’t get the internet connection to work again. Took an hour this time before I managed to make it work, and I’m not sure how I did it. Ah, well, homeward bound soon. Missing the family. Will be good to be home. never sets, I would not really call it the land of the midnight sun. feel about that skeleton in the closet being shown the light of day. everyone and everything they had ever known. water acting in unsual ways. But another time…. though, I am off to bed to dream of cloud berries and dramatic vistas.